The buses Rome network is has over 350 bus lines and maybe it can get confusing to find the right bus. Here you can find all the information that you will need for the main buses Rome lines and some tips that will help to get around the city by bus. The tickets must be purchased in advance from the Tabacchi (shops with a sign with a T), from Kiosks, ticket machines (they don’t give any change!) located next to the main bus stops, rarely you can get a ticket directly on the bus. If you are planning to use the bus regularly it is better to get a travel card, that can be annual and monthly travel cards, or to buy a Day pass, 3 Day Tourist Pass (BTI) and Week Pass (CIS). You have to validate your ticket in the validation machine that you find on the bus. Night buses (N) That starts from midnight and ends at 5.00-6.00am, Night bus stops are marked with an owl and you can purchase tickets on board. Exact (E) These lines connect the outskirts of Rome with the center. The most important information is found on the bus stops, such as the bus route and its timetable. You will see all the different bus routes and numbers, just look at the direction of the bus, the arrow on the sign will indicate that, and you can see all the stops listed. You can also use the app of the transportation company, www.atacmobile.it and the ATAC website www.atac.roma.it to plan your route and get all the information for the timetable, many bus stops now include screens with the number of the bus and when the next is due to arrive. Note that from 7.30-9.00 am there is a lot of traffic and the buses are overflowing with passengers, don’t get impatient if the buses are delayed or if you get stuck in traffic jams. **Note that the bus 40 Express is a bus that connects most of the tourists attractions. Rome’s bus network is extensive and functions quite well, but the metro (subway) is much simpler for the short-term visitors to master. Public transportation Tickets must be purchased in advance from tabacchis, newsstands, bars, or vending machines (exact change only!) at metro and major bus stops. Rome has a terrific underground railway system that will get you near most tourist destinations. The Roman Metro has three lines – A, B and C, plus a new branch of the B line, called B1, which goes from the “Bologna” stop to “Jonio”. The combination of A and B lines is X-shaped; the two lines cross at the city’s central railway station, which is called Roma Termini. Line C is not yet connected to the rest of the network and has hardly any interest for usual sightseeing. The metro system is efficient and affordable, and metro maps are easy to navigate: beware at rush hours that the trains can get very crowded. Line A: Anagnina, Battistini, Lepanto, Ottaviano/San Pietro, Piazza di Spagna, Termini. Line B: Laurentina, Eur Fermi, Ponte Mammolo,Porta San Paolo, Termini. If you don’t want to tackle buses, it’s very possible to simply walk. Distances in Rome are not impossibly vast and many sights are within walking distance of each other. Monument clusters are a rule, so if you’ve reached one major sight, you can be pretty sure many others are at a stone’s throw. 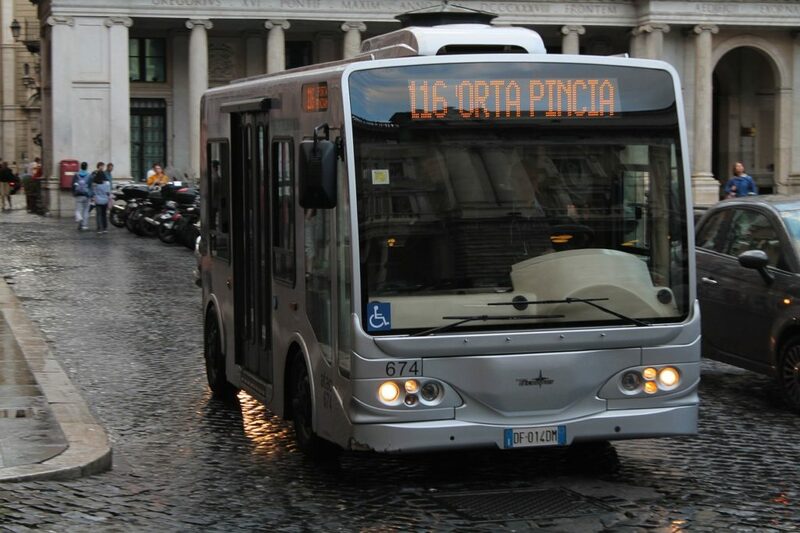 Rome’s mini electric-bus routes are particularly helpful for visitors going to many of the popular tourist sights. Note that there are differences in routes for weekends and evenings.